Who doesn’t like a versatile clothing staple that can be worn anywhere and everywhere? If you adore picking out fashion staples that are budget-friendly and super-functional, this long sleeve swing dress is a fabulous bargain! This long sleeve swing dress has an effortlessly chic appearance with a minimalist flair, which makes it super functional for any given occasion, be it college, work, a casual day at the mall, a date that involves horseback riding, hiking, or just a dinner with friends. The simplistic statement is marked with minimalist accents, and the sleek tailoring will emphasise your curves and give them a shapely sensuality. The thigh-grazing length is perfect for women who adore flaunting their legs with confidence. The style is utterly voguish and creates an elegant statement that is super functional for both, day and night. It features chic pockets that allow you to hoard in your things, making it perfect for work, college and even the mall. One of the best features of this long sleeve swing dress is the fact that allows one to mark a smooth styling transition from work-to-play without having to stop home after work and change outfits before you meet up with your friends for drinks. All you have to do is open up your hair, put on some red lipstick, and voila! 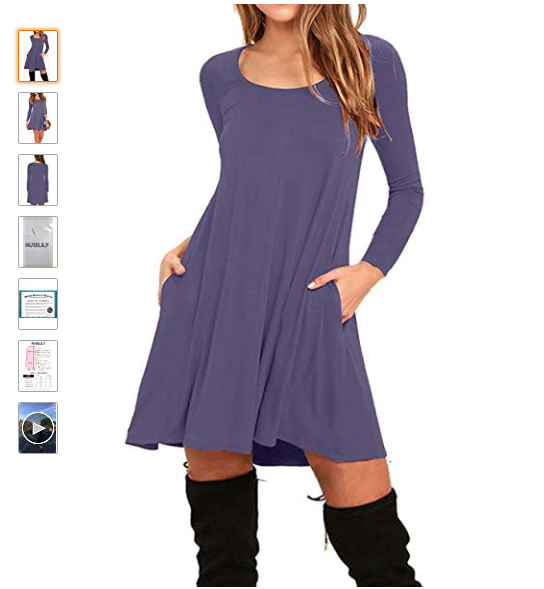 Another strikingly deal-breaking revelation: you can pick out this insanely chic long sleeve swing dress in a wide range of exciting colours, 12 to be exact, including purple, red, grey, blue, purple gray, pink, and mauve, green, black and many more. It is also available in a wide variety of sizes that would complement the body structures and curvature of all kinds of body shapes, including apple, pear, plus size and hour glass. You can pick out sizes US4-20, which includes small, medium, large and 2X large as well. The long sleeve swing dress is a token of luxurious comfort with its fine fabric, 95% rayon and 5% spandex, which makes it a fashion statement that can flaunted all-year round, in both, summers and winters. The best part is, it provides a subtle stretch and comfort with a fitted tailoring that allows you to ravish your curves without feeling like you’re being suffocated by the seams. Its flowy hemline gives a flirtatious playful to the thigh-grazing length. The fabric is extremely lightweight, feather-like soft and breathable, which is why it is perfect for girls who are outdoorsy, and also like to dress up chic when indoors. This insanely voguish sundress can be flaunted at any given occasion, be it a casual day on the streets, or even a beach party. You can play up several different looks with this statement, for instance, pair it up with your knee high boots and it will create a sassy Californian look. Or you can flaunt it with your faded and distressed denim jacket for a retro-style statement. If you want the look to be edgier and bolder, pair it up with a leather biker jacket and dark ankle boots.